The 1864 Democratic National Convention was held at The Amphitheatre in Chicago, Illinois. The Convention nominated Major General George B. McClellan from New Jersey for President, and Representative George H. Pendleton of Ohio for Vice President. 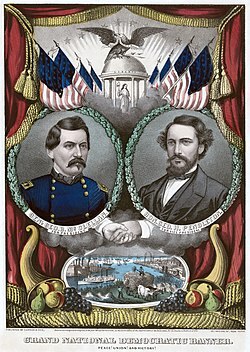 McClellan, age 37 at the time of the convention and Pendleton, age 39, are the youngest presidential ticket ever nominated as of 2016. The Democratic Party was bitterly split between the War Democrats and the Peace Democrats. Also making matters complicated were the factions that existed among the Peace Democrats. Moderate Peace Democrats who supported the war against the Confederacy, such as Horatio Seymour, were preaching the wisdom of a negotiated peace. After Gettysburg, when it was clear the South could no longer win the war, moderate Peace Democrats proposed a negotiated peace that would secure Union victory. They believed this was the best course of action because an armistice could finish the war without destroying the South. Radical Peace Democrats known as Copperheads, such as Thomas H. Seymour, declared the war to be a failure and favored an immediate end to hostilities without securing Union victory. On the first day of the convention, a peace platform was adopted. McClellan, the front-runner for the Democratic nomination, was personally opposed to a peace platform. McClellan supported the continuation of the war and restoration of the Union, but the party platform, written by Copperhead Clement Vallandigham, was opposed to this position. General George B. McClellan and former Connecticut Governor Thomas H. Seymour vied for the presidential nomination. In addition, friends of Horatio Seymour insisted on placing his name before the Convention. But on the day before the convention commenced, Horatio Seymour announced positively that he would not be a candidate. Nonetheless, a portion of the Illinois delegation placed Seymour's name in nomination during the convention. Seymour, the permanent chairman at the Democratic National Convention, declared that the Illinois delegate was "not in order" since a different motion was already under discussion. Other candidates were placed in nomination before eventually being withdrawn. Senator Lazarus W. Powell was placed in nomination by the Delaware delegation, but Mr. Powell personally asked that his name be withdrawn since he believed the eventual Democratic presidential candidate "should come from one of the non-slaveholding States." Amid "great applause", a portion of the Kentucky delegation placed the name of Former President Franklin Pierce before the convention. But Pierce's name was withdrawn from consideration when a delegate revealed that he had received both written and verbal instructions from the former president stating that he did not wish to be presented as a candidate. After a revised first ballot, McClellan, a War Democrat, was nominated over the Copperhead Thomas H. Seymour. The motion to have McClellan's nomination be declared unanimous was carried. Eight names were placed in nomination: George H. Pendleton, James Guthrie, Lazarus W. Powell, George W. Cass, John D. Caton, Daniel W. Voorhees, Augustus C. Dodge, and John S. Phelps. Following the first ballot roll call, the names of Guthrie, Powell, Caton, and Phelps were withdrawn from consideration when it was revealed none of them desired the nomination. Before the first ballot could be finalized, 70 delegates who had supported one of the withdrawn candidates shifted their votes to Pendleton. As a result, Pendleton was supported by a majority of the delegates when the vote for the first ballot was finalized. With the exception of Pendleton, the remaining contenders were favorite son candidates who only had the support of their home states. During the second ballot roll call, each state recorded its vote for Pendleton. Pendleton, a close associate of the Copperhead Clement Vallandigham, was an anti-war representative from the electoral rich state of Ohio. Since the Democrats were divided by issues of war and peace, Pendleton's well-known and vehement opposition to the Union war effort balanced the ticket. ^ "The 1864 Democratic National Convention". Chicago Historical Society. 1999. Archived from the original on 2007-04-04. Retrieved 2007-05-03. ^ "1864 Democratic Platform". Archived from the original on 2009-06-14. Retrieved 2009-06-10. ^ "George B. McClellan". Ohio History Central. Archived from the original on 2009-06-14. Retrieved 2007-03-06.